Cutting soda bottles in half with a katana. Smashing a car with a four-ton wrecking ball. Cracking open pressurized spray paint cans with an axe. These are all viral-friendly actions that would likely garner thousands of views online. However, what happens when you do any of them in complete slow motion? As evidenced by The Slow Mo Guys, you create an entertaining online spectacle. 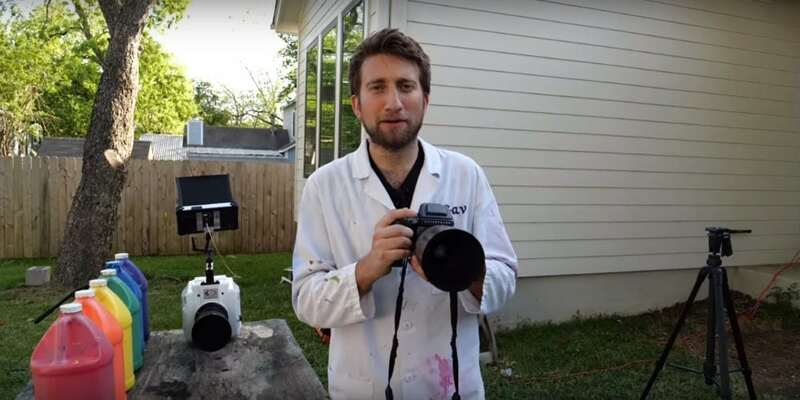 Featuring hosts Gavin Free and Dan Gruchy wielding an extremely high-quality camera, The Slow Mo Guys YouTube channel has become a staple of viral visual experiments since launching in 2010. With videos that commonly garner millions of views and over ten million subscribers, The growth of The Slow Mo Guys has been ironically quick. We spoke to the channel’s creator and co-host Gavin Free about the channel’s early beginnings, the type of tech used for their slow-motion videos, and the freedom that online video production yields. Innovation & Tech Today: What kind of gear do you use on the show? How has that evolved over time? Gavin Free: We’re now in our fourth version of the camera since we started. This current one does a thousand frames a second. Which is pretty impressive considering the image is like eight megapixels. Our first one was definitely about this. They just slowly improved frame rate, along with resolution, to the point where you don’t always get huge leaps in frame rate, but we’re still doing a thousand even though we were doing a thousand 10 years ago. It’s just much higher resolution. If you lower the resolution, that’s when you can bring up the frame rate. I&T Today: You guys have been doing this for a few years. Do you have a personal favorite video that you’ve done together? Gavin Free: I have tons of favorites. Dan and I have different favorites. I often like the ones where he’s getting hit in the head with a football or something. I think that’s a very nice visual. We’ve got one where we put paint on airbags and set them all off and they made a sort of big rainbow explosion that was kind of cool. We’ve used that for marketing a few times just because it’s such a nice visual shot. I&T Today: Where do you see the future of the channel going? Gavin Free: I think that there’s always going to be a demand for seeing stuff slower than you can see it with your eyes. I think that’s always going to be interesting. As technology improves and the frame rates go even higher, you can slow down time even more, and then you can start seeing the next level closer. For example, right now, at 1,000 frames a second, we can slow an explosion. Or slow a bullet. It’s still incredibly fast, even at 1,000 frames a second. As soon as we’re able to shoot millions of frames a second, we’ll be able to slow down the next level of something. I&T Today: How have you enjoyed that transition to doing some YouTube Red-exclusive content? Gavin Free: The biggest change for us making it was that we have a crew. Usually, the whole seven or eight years that we’ve been doing this on YouTube, there’s never been any crew. It’s just been Dan and myself. I run all the cameras and Dan sort of arranges all the projects. We actually had a full-on crew of over 50 people. It’s insane. It was a real production. I&T Today: May I ask you what video you’re working on now? Gavin Free: I could tell you. The next one to come out … I’m working on two right now. One of them is another one based on a 50,000 sniper rifle, where we shoot a bullet directly into the camera. We actually shoot a mirror. That way we didn’t have to shoot a very expensive camera. The other one I’m working on is how TVs work in slow motion. With the refresh rate and update the image 60 times a second or whatever it is. It’s all about the progressive scan of TVs. I&T Today: Since digital content has changed so much, have you thought about branching out a little bit as well? Or are you enjoying creating YouTube content? Gavin Free: Certainly enjoying YouTube for the moment. It’s definitely where our biggest audience is. Right now, there’s no real focus on anything other than YouTube. There are really very few rules. You can set your own rules when it comes to your brand. As far as something like that goes, we have very few rules when it comes to the length of the video or what the video has to be about or if it has to contain anything. It’s really just whatever we feel like making, and that freedom has been great the whole time.